d3o is a complex elastomeric compound discovered at the University of Hertfordshire. A shear thickening material, it is flexible when moved slowly, but when it is compresssed by an impact, its molecules lock together. The material stiffens, spreading the impact over a greater area. 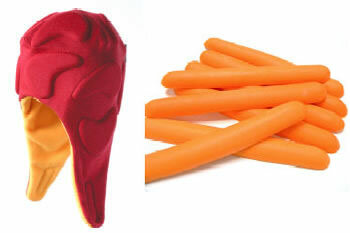 The Swiss company Ribcap is bringing out a new line of headgear for snowsports based on this material. The Ribcap (shown below) is a combination soft, flexible beanie - and tough helmet. she [Gough] had a rather dramatic fall that terminated on her head. "I was a bit dazed, and I almost wasn’t sure whether I had actually hit my head, although the concern I got from those who saw it assured me that I really had, and quite hard!" This is a common reaction to real world d3o impact trials. d3o is so comfortable it feels like an extension of you. It’s very easy to forget it’s there, and you’d be forgiven for thinking, in that split second before you hit the ground "this is never going to work..."
"It was my impact suit," Purple said. He took a step forward and thumped himself hard in the belly with this fist. His belly was big and soft, so the blow should have made him wince. It did not. I thought for a moment that Purple had become rigid as stone. Read more about these materials in Liquid Armor In Two Flavors: Shear Thickening and Magnetorheological; read about other uses for d3o or visit the d3o website. Thanks to Winchell Chung for contributing the tip for this article. Update: Take a look at the comments on John Brunner's karatand w/photo from his 1968 novel Stand on Zanzibar (thanks, readers! ).